IT IS more difficult to bridge the generation gap in a family which adheres to a strict hierarchical order. Although this situation applies to all families, the problem seems to be prevalent among Asians. Asian families consider the family bond as sacred. I personally grew up in a Chinese family. The elders in the family follow the hierarchical system, which endows them to have a final say in any decision be it school, friends, religion and sometimes even marriage. As the elders occupy a dominant position in the decision-making process, this widens the generation gap between family members. Although this appears as an effective discipline mechanism on the onset, it also paves way for increased friction between the elders and youngsters due to lack of understanding. Sociologists observed that families adhering to a strict hierarchical order find it more difficult to bridge the generation gap amongst its members. Children entering into adulthood would normally experience high parental expectations, leading to emotional pressure and anxiety. Those unwilling to abide by the expectations set by their parents are often labelled as a “disobedient child”. Many times I have heard stories from the elders who were upset with their children’s behaviour because they refused to follow the parents’ will. Most parents believe that they know what is best for the child. Hence, some have even planned the entire life for their children. Potential parents-to-be are observed to love indulging in discussions as to what they would like to see their yet-to-born children be in the future. 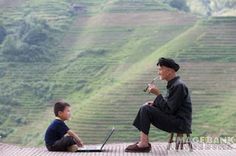 It is interesting to note that in China, some parents send their 7-year-olds to business school for intensive training as they hope that the children will be running the family business and become leading entrepreneurs in town one day. These people have failed to realise that each child may have his or her own set of interests, which they may like to pursue as they get older. To expect their children to adhere to their wishes make them appear as autocrats. Children who yearn for complete freedom will then one day revolt against any restrictions imposed on them. For this, they are then labelled as “hard-headed” and “rebellious”. Asian parents in particular find it a gesture of disrespect should their children not conform to their wishes. Do parents actually realise that they too had a role to play in that conflict? Children in these families feel so suffocated with their parents’ expectations that the only way out they could see was to rebel against them. Rebellion is however not always vocal. Some children shy away from confronting their parents, and end up adopting a silent rebellion. This is so that heated arguments can be avoided without also the need for them to be labelled as a “disobedient child”. This too is not healthy for the family as many children begin to isolate themselves from their parents as they grow up, which again gives more room for misunderstanding to occur amongst family members as the communication barrier increases day-by-day. This may even lead to a serious family breakdown. Instead of saddling unnecessary expectations on the child, lecturing what he or she should and should not do, why not start setting healthy boundaries, and more importantly, give the children a pair of wings? As the child is transiting into adulthood, it is vital for parents to change and rebuild the adult-to-child guardianship to adult-to-adult friendship. This in fact is helpful in keeping the line of communication open. Here, parents exemplify respect for the adult children’s opinions and avoid being too critical with their decision-making. Not only will the child feel loved and supported, he or she will also yearn to do their best in bettering the relationship with the parents. Children become more honest and open in discussing important matters, which also in turn allow the parents to feel that their views are appreciated. It is a win-win situation. The keyword here is to “listen” instead of dominating the situation. Parents who try to hold onto the past and judge the children’s decisions will only destroy the bond between them. There is always a fine line between sheltering and helping the child. It may not be easy for parents to transform themselves from being a disciplinarian to be a friend. However, with enough effort and dedication, it is possible. It is all about setting boundaries between parent and child. Whenever an adult child faces life challenges such as experiencing relationship issues, social pressure, exams, career stress and so on, he or she would also expect a certain level of understanding and emotional support from their family members, especially the parents. Children always appreciate some guidance when given in a charismatic way. Parents should again remember not to appear aggressive by commanding the child to do what the parents think is right in order to handle the situation. Children on the other hand can also help make it easier for the parents’ transition in becoming a friend. They can play a constructive role in breaking the ice to fill the generation gap by being a little bit more pro-active in the communication with their parents. In most situations, the parents would usually want their children to understand the sacrifices they have made to bring up the child. Therefore, a child can talk to his or her parents, try to understand their fear, stand out and convince them that you have the ability to be independent. One will often be surprised that sincere confrontations can bring positive results and save your relationship with the family. Planning a family-outing and devising healthy dialogues (avoiding heated family issues at all cost) during conversations also help reduce the friction between the different generations. Very insightful article. It is easier to raise children by imposing a set of rules (governance by dictatorship) rather than provide constructive guidance (governance by leadership). The former approach carries potential conflict within it, as rules are by their very nature are inflexible, whilst the latter approach encourages harmony. Thank you Mr. Thurman for your kind and encouraging comment. I believe both aspects of dictatorship and leadership are necessary in bringing up a child. For example, small children who are still too young to think would require the parents to hold their hand and direct them to do certain things that would benefit their well-being. However, as the child grows older, leadership should become more prominent in the parents' role as the child is already beginning to think and have interests of their own. I believe that the mode of communication that parents choose is the most important factor of all in parenting. I loved the article Tey. I myself am Chinese and I think Chinese parents can be quite harsh in bringing up their children. Some families have no consideration at all for their children's views. THey always dismissed us as merely children even though we are already grown up. I am in my late 20s, yet my parents believe that they know better than me. I acknowledge their concern, but sometimes they are just way too much. Their criticisms are not only unhelpful but are driving me nuts!! Ever read of Amy Chua's book? I know that there are many who'd think that the Chinese way of bringing up children is harsh and maybe should not even be practiced at all. But I am what I am today coz of my parents' way of raising children. At least I don't stray like the white children did around me. I studied and I came up in life!! now now anonymous. let's not make this a racial debate! i've read amy chua's book myself. i am white, but i too came up in life. it all depends on the individual, not the colour of our skin. not all whites stray away from their duty and not all chinese are successful. i know quite a number of chinese people who conned their way through life to make a living. what happened to the superior way of bringing up the children the tiger way? ?